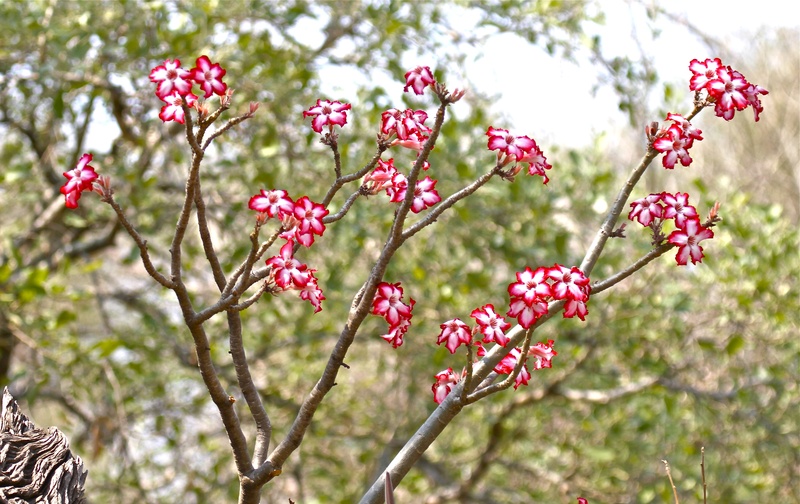 The Impala Lily (Adenium obesum) found all over the Kruger National Park, in Swaziland, Zimbabwe and Zambia it is on the Red Data List as being a threatened species. The Impala Lily flowers in winter July to September, it flowers after having dropped all its leaves and the flowers are so striking that they seem to glow. It is a succulent plant that has a huge tuber hidden under the ground, acting as a storage device, therefore it needs very little water to survive. My friend has given me an Impala Lily which she has grown from seed and I have no idea how to look after it except that it does not need much water. Could you please advise. I don’t really know. What I can tell you is that the plant comes from a summer rainfall area so I guess you would water it in summer and not at all in winter.